Finally made it over here from the other site. I'm in LaCenter, Ky about 10 miles from the Mississippi river. Well hi there Terryj, did you do an intro?? If so, sorry I didn't welcome you but hey MMMOOOOHHHHOOOya!! Old bikers don't gray, they CHROME OUT!! Welcome TerryJ. How close are you to Wickliffe? I did some work at the paper mill there a few years back and got some nice Harley tees from Sills in Paducah and even made it up to Minors in Cape Girardeau one day. Late to this thread I know. Still finding my way around. Live 20 miles from new dealer in London. Work im Barbourville, Ky.
Those who say it can't be done should get in the way of those doing it. 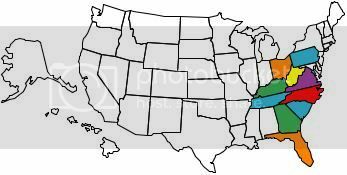 Well I'll be the first from the eastern side of the state...Ya'll look at a map and see where WV,KY,VA all come together??? I am right there!!!!! I don't know how many of you guys remember me but I have a cabin near Morehead now. We make it down there quite a bit maybe some of us can meet up for some miles and smiles some time. 2012 Road Glide Ultra, Big Blue Pearl. No fair! I think I'm a year older than me. Retired? That's clean livin'. Wow! Morehead, smack in the middle of the Dan'l Boone national forest? Fabulous! How far is Morehead from Cincinnati? About two hours, or 100 miles give or take. Any of you KY folks know where this is?